Content technology. Sometimes it feels like we can’t live with it. But we know we can’t work without it. Consider this finding from CMI’s 2018 Content Management & Strategy Survey: 51% of the content professionals say their company lacks the right technology to manage content across their organization. And another 35% say they’re not using the technology they do have to its potential. Only a sliver (14%) say they have the right technology and are using it to manage content across the organization. 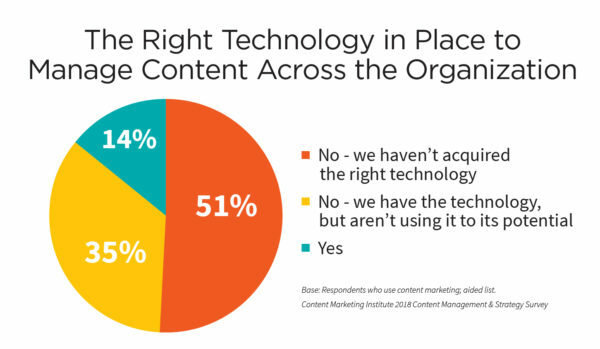 Why do we as content marketers struggle to get the right technology in place? It’s not for a lack of options. Anyone who has seen that ubiquitous martech landscape chart knows that. But having more choices only adds to the complexity. From those 5,000-plus options, you have to choose tech that will work for content creators, content strategists, content consumers, anyone who handles content governance, marketing or business analysts, the IT department, and so on and so on. This isn’t easy. In fact, the Content Marketing Institute recognized that and is evolving the Intelligent Content Conference into the ContentTECH Summit next year. The vision sprang, as CMI Chief Strategy Advisor Robert Rose writes, from the challenge marketing leaders face: the effective use of technology that helps create, manage, deliver, and scale enterprise content and marketing. But let’s take time now to identify at least three ways you may be making the tech process harder on yourself and your team (and corresponding ideas to make it easier). You know CMI research points to a documented content marketing strategy as one of the things that separates successful content marketers from those who say they’re less successful. Doesn’t it seem logical, then, that a documented content technology strategy would be a dividing line between successful and less successful tech implementations? Both Robert Rose and Cathy McKnight, co-founder and head of the enterprise consulting practice at Digital Clarity Group, underscore the importance of a tech strategy. Cathy sees a tech strategy as an antidote to the “shiny new thing” syndrome. Instead of running after new technologies, she recommends, take a step back and really understand what you have (in terms of tech capabilities and people who can put them to use) and what you truly need. 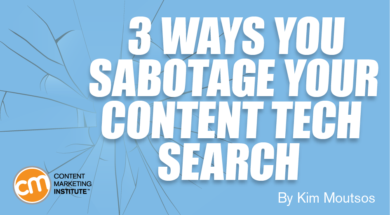 You might find you already have the capabilities in your content tech stack. Or, you might find that a purchase makes sense. Either way, the resulting decision will be grounded in what makes sense for your goals and your organization. Tony Byrne, founder of tech analyst firm Real Story Group, says marketers have been relying on the wrong things to filter their content tech choices. He feels so strongly there’s a better way that he co-wrote a book called The Right Way to Select Technology: Get the Real Story on Finding the Best Fit. Horse race – You choose technology based on static analyst-firm pronouncements about which tech vendors offer the most/best/newest capabilities without regard for what you’re trying to do. Love at first sight – You’re enamored by the first tool you see and don’t consider other options that might fit better. My Cousin Vinny – You choose a solution because you know another company in your market segment uses it; however, that company may not have the same content needs or use cases. Happiness is a stack of warm binders – You spend a ton of time on developing tech and business requirements, loading them into spreadsheets, and weighting each factor mathematically; the problem, though, is that what looks like the solution on a spreadsheet may not work for people. A human-centered approach to innovation that draws from the designer’s toolkit to integrate the needs of people, the possibilities of technology, and the requirements for business success. Resist the urge to create a checklist of features to guide your tech selection. Instead, keep things focused on the people involved through stories or user journeys. Narrative journeys represent different stakeholders (customers, authors, editors, developers, designers, etc.). Describe to-be states based on real people. For example, Ben works with his boss Louise at a public university to create microsites for 40 to 50 new partnerships every year. They need to be able to clone a site, then add some new and some existing content. Finally, they need to collaborate with their external partner, Bill, on the project. Done correctly, requests for proposals explain your needs. In design thinking, you include the user stories generated in Step 1 and ask the vendor to show how they can make those scenarios possible. Your RFP doesn’t have to be perfect. It should be good enough to start a conversation based on real human beings’ journeys. Send this RFP to a short list of vendors. Once you get the proposals, you’ll probably realize you didn’t get your user stories exactly right. Nobody does, Tony says, because it’s so hard to capture an interactive, collaborative experience in words. You might have to think of new ways to describe what you need the technology to do, particularly if you left out a critical story. Or, if all the vendors can respond successfully to one of your narratives, you don’t need to include that one going forward. Use the responses to the RFPs to select the vendors you invite to provide demos to your team. 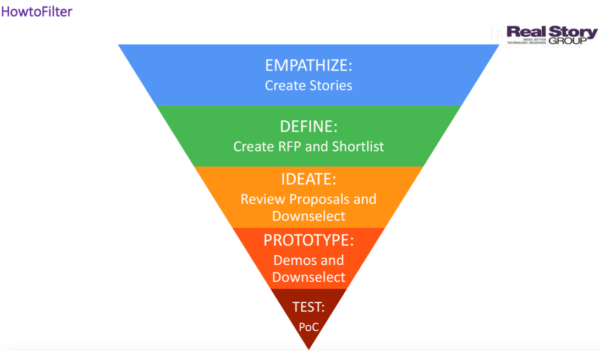 Vendors should tailor the demos to your user stories to show why they’re a good fit. Set a fast pace for the demo meeting and take a break to check in with your team. Take the learning from the demo and edit your user stories. Narrow your vendor list to two and ask them to address the edited user stories during the proof of concept/test phase. “The most important thing – the one thing that I really wish you to remember – is how essential it is that the final phase of this process is a competitive proof of concept, or what we sometimes refer to as a bake-off,” Tony says. Why? It’s the only real way to know if the technology fits the people involved. And that means you must have Ben, Louise, and Bill work with the software for a few days or a week. “Any vendor that doesn’t let you do that is one you need to walk away from,” Tony advises. Skipping this step is akin to choosing a new car after watching a salesperson drive it around the parking lot. Though he admits the advice to look ahead is sound, it’s not always a useful way to talk about tech buying. “That phrase has caused so much damage in the technology world, because we’re all trying to be where the puck is going. But we’re not actually very good at our stick handling right here in front of us,” he says. The unexpected truth, Tony says, is that companies face more risk from overbuying technology than from underbuying. This sounds counterintuitive­ until you consider how hard using and managing a complex piece of technology can be. Overbuying just makes everyday tasks too hard. Want to go more in depth to solve your content tech challenges (or at least address them in smarter ways)? Check out CMI’s new ContentTECH Summit.